Offering culture, incredible valley views, hot drinks, vodka menu, delicious food, and abundant wildlife, The Polish Place makes a day out in the mountains more memorable than ever before. The concept of a polish feast by the garden has been brought to life by Phil and Ania Sowter through the creation of The Polish Place, and has become an attraction for visitors from around the globe. Surrounding views have the wow factor and are so expansive, they can be easily seen from both inside and outside tables and there is plenty of seating. Extremely friendly rainbow lorikeets frequent this place in droves and colour the surrounding gardens and trees with their bright blue, orange, yellow and green feathers. The lorikeets are so cheeky, one actually flies off its perch and lands on my uplifted hand right next to my camera, just as I am trying to photograph it. For those interested in Polish culture, their Polish Gallery is filled with Polish art, hand-made tapestries, sculptures, and jewellery. An impressive list of over 32 vodkas and polish beers on the menu is exciting. But on a fresh mountain morning, I decided on the Polish hot chocolate with a plate of vegetarian pierogi which are polish dumplings. Filled with wild porcini mushrooms and sauerkraut and slathered in a porcini mushroom and creamy onion sauce, the pierogi are soft and delicious. For meat lovers, the meat and herb pierogi is served with fried bacon and onion. A large pork hock baked in beer and garlic herb butter called Golonka is listed as their signature dish on the menu and will especially appeal to males who love their meat and beer. For those that prefer a lighter option, there are canapés and soups or salmon. Just save some room for dessert. For those who just don't want to leave, The Polish Place offers fabulous self-contained cottages with spas, literally built on the edge of a cliff for breathtaking views of the mountain ranges. Speaking with owner Phil Sowter, I am struck by his passion for the place and the 'hands on' attitude he employs. No job is too big or too small, and although Phil has enough staff to run the place without him, he can't resist jumping in to make delicious looking ice cream sundae for a customer. It is easy to understand why this beautiful place regularly wins awards for excellence. 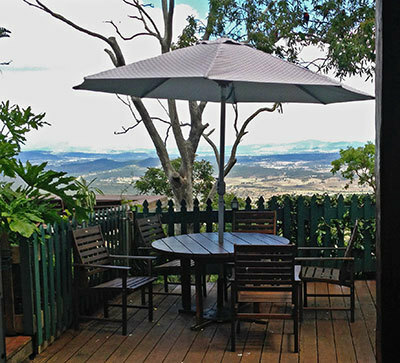 Open for drinks, lunch or dinner, and for romantic overnight or weekly stays, The Polish Place lies just an hour's drive from Brisbane at Mt Tamborine on the Gold Coast.